Bring the delicate blush of pastel pink or the vibrant tone of fuchsia to your wedding thank you cards with customized stationery from Wedding Paper Divas. As the color of universal love, pink is especially suited to post-wedding correspondence. Wedding Paper Divas stocks traditional folding-style cards that deliver a classic feel as well as contemporary postcards for extra convenience. Use pink thank you cards to coordinate your notes of gratitude with your wedding invitations or engagement announcements, or create an entirely new design uniquely geared toward showing your appreciation. Select a bright coral or salmon background for a refreshing, peaceful tone, or opt for a bit of formality by pairing rose-hued lettering with a black background. Choose a design with glittery gold tones to add glamour to your cards; this is an especially appropriate option for weddings held in high-profile locations. In addition to sweet pink designs and bold borders in darker shades, personalization options such as photo uploads offer plenty of ways to make your thank you cards distinct. Decorate the front of your folding card or postcard with your favorite wedding photograph. Choose one special photo, or use a block-photo template to upload two or three of your best pictures from the big day. Pink represents affection and friendship, so choosing a rose-tinted color scheme shows how much you value and appreciate your wedding guests. Use pink-imbued thank you cards to jot a quick note of appreciation while sending friends and family members a fun reminder of your wedding day. There is plenty of writing space inside of the folding thank you cards and on both sides of thank you postcards. 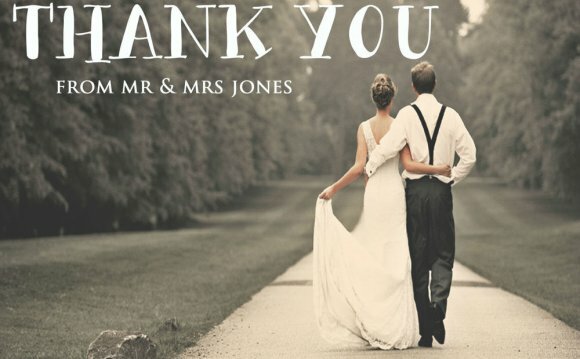 "I ordered these thank you cards for my wedding and they are beautiful. I used a Hi-Res photo from my photographer and because of the card stock the picture isn't as crisp as it could be. Other than that it really is a beautiful card. I used Wedding Paper Divas for my invitations as well. I love this site and the ease of placing orders." "This is my second purchase from wedding paper divas and again I am very happy with my product. Easy site to navigate, super fast delivery all the way to NZ. The print and paper quality would have been perfect if the bottom pictures hadn't been cropped slightly. They still look great but it may pay to check your not going to lose anything important if the bottom is cropped just a smidge. Again very pleased with this company :)"
"I loved our thank you cards. We chose the color coast on the cards and added all of our coastal wedding pictures and it turned out beautiful." "I ordered these thank you cards in the Chenille color (blush pink). When the cards arrived and we folded them the blush pink is hardly noticeable and looks almost white. Other than this the card is very nice. the color just seems a bit more pink on the computer than in person." "I really loved the design of this card! The dress is just beautiful against the soft pink background with the gold accents! Everyone LOVED it!"